Preheat oven on 180 degrees Celsius. Add diced mushrooms, chopped red onions, 2 cloves of garlic diced, apple cider vinegar, and a teaspoon of garlic and herb salt into a wok and dry fry it until browned and fully cooked. Boil the sweet potato for 15 minutes and mash it. 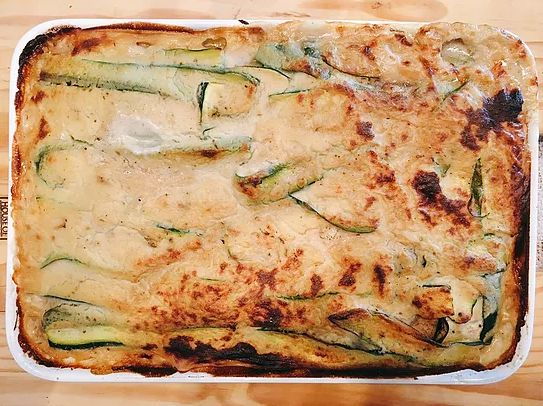 Layer the lasagne in an oven-proof dish as follows: Add half the sliced zucchini as the bottom layer, add sliced large aubergine, add half the mushroom mix, add some of the cashew cheese evenly over the mix. Add mashed sweet potato evenly across the dish, add remaining half of zucchini, add sliced baby aubergine, add remaining mushroom mix, add cauliflower bechamel sauce evenly over the top. Once heated, put dish into oven for 55 minutes.